The first timepiece in his collection, the Complication One model, pays tribute to time-honored watchmaking tradition and know-how. With its new type of transmission system and way of reading time, this masterpiece breaks the traditional codes of watchmaking to reveal the movement’s intricacies and to provide a spectacular visual effect. Complication One is powered by the caliber EB-1963, a mechanical, hand-wound movement composed of 283 parts developed exclusively for this timepiece and entirely made in Switzerland. Nestled in an elegant and contemporary 44mm case, the very essence of the mechanism is given a prominent place on the dial ensemble. Positioned at the center stage, the double escape wheel with inward teeth and the anchor, with their revisited design, offer a striking indication of the time flow. In most watches, the regulating organ oscillates between 21,600 to 36,000 alt. per hour, making it impossible for the wearer to observe in detail the inner working of the mechanism. Complication One, on the other hand, magnifies both the indication and our perception of time. The frequency of 18,000 alt. per hour is deliberately low to pay homage to traditional watchmaking and to highlight the mesmerizing behavior of the escapement. 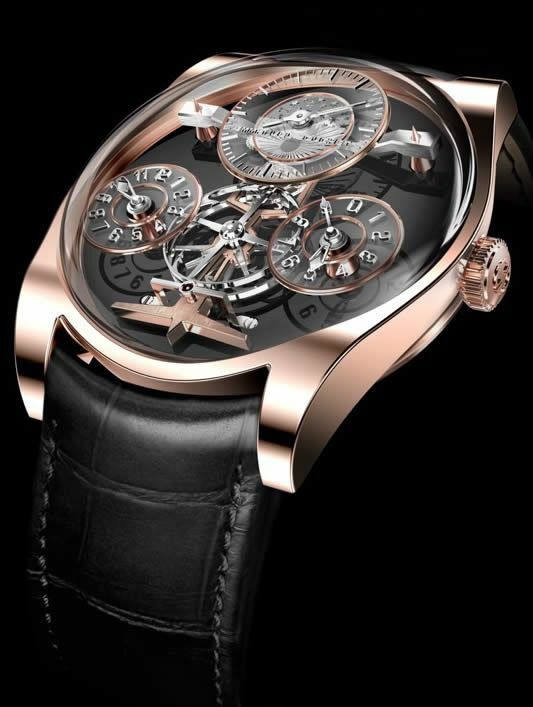 This allows the wearer to contemplate the movement and to understand how time works mechanically in a captivating and unique way. The double barrels guarantee a 72 hour power-reserve which is indicated on the back of the timepiece. One barrel drives the going train to the escape wheel, regulated by a free-sprung balance on a Breguet type overcoil. The second barrel keeps the transmission escapement on the dial under tension. This escapement snaps forward every fifteen second to replicate what goes on in the other escapement five times a second. The center wheel of the first train rotates an elliptical triangle, which turns in the lever fork on the dial, swinging it aside every fifteen seconds to unlock and lock the double escape wheel. Attention was given to every detail, from mechanical excellence to design aesthetic and finishes. The dynamic, multi-level dial is comprised of sapphire discs that seem to float in space over a white or black onyx dial base. Hours are displayed at 8 o’clock while minutes and ten-minutes are indicated in an original yet intuitive way at 4 o’clock by two jumping hands, the ten-minutes hand being also a retrograde hand. The tips of the hour and ten-minutes hands are finished with sanded sapphire to accentuate the legibility and add a refined and elegant touch to the design. A resolutely contemporary day-night indicator, revealed at 12 o’clock on a disc underneath the seconds disc, further accentuates the powerful and harmoniously balanced design.